The Book Thief, narrated by Death, is about a girl, Liesel Meminger, fostered with a family outside of Munich during World War II. If you need a book review or if you need to integrate Zusak's work into a research paper, have the writers at Paper Masters custom write your project. 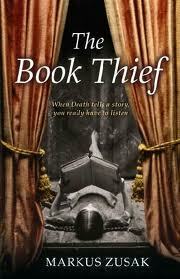 Any aspect of The Book Thief can be explicated by our trusted literature writers. Even if you need the historical background of this brilliant work of literature, have us prepare the project for you. ...It’s a small story really, about: a girl, some words, an accordionist, some fanatical Germans, a Jewish fist fighter and quite a lot of thievery. Nevertheless, Death follows this tale closely and it affects him throughout the years. Risking life and limb, Liesel spends the war years stealing books that are condemned, even as her foster family hides Max, a Jewish man, in the basement of their home. Liesel’s foster father (the accordionist), is an upright man whose word is his bond not matter what the consequences. At the center of the story are the books that Lisel steals, from the Mayor’s wife (who knows and tacitly approves of her actions) and other places. After her foster father has taught her to read, she begins her own book, “The Book Thief” and talks about what she has done. Liesel’s actions defy the authority of the Nazi regime, notorious for burning anything that did not fit into their narrow worldview. Nazi’s killed those who failed to follow their tenents, who were Jews, or anyone else they felt were not within their control. Liesel’s rebelliousness echoes her foster father’s and proves that even within a disasterous and dangerous war, there are people of for whom honor, principle, and decency are paramount, even when it may mean their lives. Death’s perception of the events provides a window into the lives of all those who were trying to survive the onslaught of war and destruction. His interest in the book thief traces her life and her losses – her birth parents, her foster parents, Rudy, in the horror of the bombing and her fear that Max was gone forever. There is something about the humanity, the defiance, the survival that resonates with Death so he saves her book when it was nearly thrown away after her foster home was bombed and everything she had saved during the war was gone. After Death has taken her, many years after the war and her long and vital life, he returns it to her. It is her story and it has affected him through the decades so much, that Death himself says “I am haunted by humans” and the book thief. Utmost Savagery - Utmost Savagery Research Papers examine a novel by Colonel Joseph H. Alexander about the battle between the U.S. Central Pacific Forces and Japan. Unbroken: A World War II Story of Survival - Unbroken: A World War II Story of Survival Research Papers on a book that presents a different perspective of World War II. Non-Aggression Pact - Non-Aggression Pact research paper delve into an order placed for an essay, and gives specific topics that should be included in the project. The Sunflower: On the Possibilities and Limits of Forgiveness - The Sunflower: On the Possibilities and Limits of Forgiveness is an autobiographical book that discusses a story of an SS Nazi's dying plea of forgiveness from a Jew. Holocaust Literature - Holocaust Literature essays examine the literature created by the surviving victims of the Holocaust. Nature of Compassion in Elie Wiesel's Night Research Papers look at a preview of an order placed for a interpretive essay. Life is Beautiful research papers delve into the potential reactions people choose when faced with a crisis such as Holocaust. Paper Masters writes custom research papers on The Book Thief by Markus Zusak and discuss Death's perception of the events in the story.